Click on the links below to proceed to Member Online Bookings (April - September) or to log into Member Events. Please note, the Member Online Booking module is a separate booking system compared to how green fee players book their times, please see instructions below. Your username is your e-mail address that we have on file in our tee time booking system. Your password is what you set up originally but if you have forgotten please email Andrew or Jason. 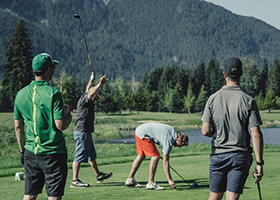 To enter a member into this group click “ACTIONS” then click “Add Any Member” or "Add from Buddies"
Click here to add in your scores on the Golf Canada handicap system. Contact Us or Keep in Touch!